Campfire takes place in a natural granite amphitheater nestled in the forest and roofed by the Milky Way. 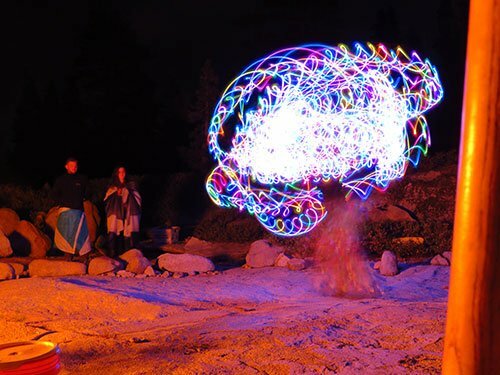 Each campfire is different and everyone participates. There are stories, songs, jokes, riddles, skits, charades, naming the constellations, musical performances, and improv comedy routines. Talented campers show how they can wiggle their ears, sing songs they have written, and play the guitar, flute, or violin. Performers have shared original poems, gymnastics, martial arts, and magic. It’s always a surprise and there’s always applause. Of course, our campfire includes a traditional marshmallow roast and making of s’mores. To make it special and to give campers time to prepare their routines, there is one campfire in the second week of every two-week session. 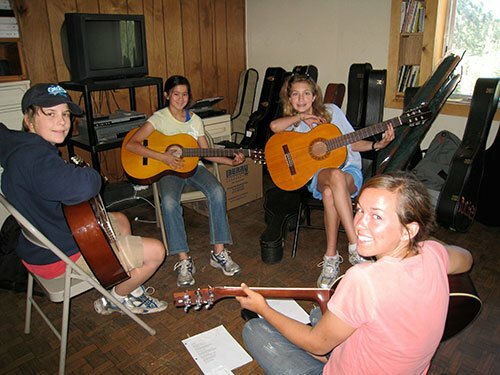 Our guitar classes get you playing a song in the first lesson. Take more classes and you learn chording, tuning, and finger picking. When campfire comes along, you can play songs you’ve learned from the Deer Crossing playbook or write your own original songs. Campers may perform solo or get together a band. Love to laugh, act, role-play, or just be silly? Join the evening improvisational comedy theater program. We base these classes on the Bay Area Theatre Sports play book and the classic television program What’s My Line? Bring your own tackle and land a delicious meal or catch and release. Loon Lake is stocked with brown and rainbow trout. Most fishing is done from the lake shore. Campers who have graduated from our canoe program can go out with a guide and canoe fish. Those who go on the canoe-camping trip may fish at the mouth of Dragon’s Lair, an underwater cave one mile long that goes to Buck Island Lake. The biggest fish caught by campers has been a 24″ rainbow. 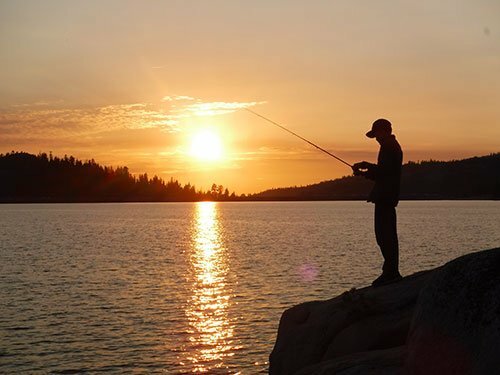 Treks into the backcountry provide numerous opportunities to cast your hook into the many streams and lakes of Desolation Wilderness where rainbow, brown, brook, and even golden trout hang out. Evenings at camp ring with the sounds of campers playing ping pong, volleyball, charades, Frisbee golf, or taking first aid classes. The game cabinet is stocked with everything from Monopoly to chess. In some sessions, theme night allows everyone to dress up Western style, in Roman togas, or with ties made in the craft room, followed by a dance.